This is an address to Christians and it has been written within the confines of what is central to Christianity. Because I am speaking to Christians, let me make the following assumptions for the purpose of responses. That because you are a Christian, you Believe that Jesus Christ is the Son of God who died on the cross, was buried in a tomb and rose on the third day to take away the sin of the world after man had been condemned to die following the sin of Adam. Having been convinced of your sins by the Holy Spirit, have repented and accepted God’s forgiveness. Believe the bible to be the infallible word of God and you strive daily to live by the precepts therein. Believe in the mystery of the Holy Trinity of God the Father, the Son and the Holy Spirit. Attend a bible believing church were the word of God reigns supreme with the aim of joining other believers to build your life after the pattern of Jesus Christ. Have the overall hope of making heaven and being with God either through death which is inevitable for all men or at the second coming of Jesus Christ. Having laid this foundation, let me put forward the question that this write-up will attempt to answer and in answering this question, I may be focusing on pastors, but I am also addressing church members too. Because just as your pastor is supposed to be an example to you, you are supposed to be an example to unbelievers and they hold you to the same expectation of perfection as you hold your pastor to. Simply put. We are all pastors. Firstly, God is not rich, neither is he poor. God is God, and God is spirit. (John 4:24 – “God is Spirit, and those who worship Him must worship in spirit and truth.”). Poverty and wealth are human conditions based on the absence or presence of money. God cannot be classified into human social classes. However, Jesus Christ came to earth and lived as man and his life here on earth has become the perfect example for us to follow as humans. As I read various arguments, for or against extremely wealthy pastors who flaunt wealth, I couldn’t shake several questions out of my head. What is God’s view on all this? And when I say God’s view, I mean what the bible actually says, not some intellectual or motivational interpretation of the bible. If Jesus was a modern day pastor, will He own jets and live in multi-million naira mansions? Will He be fashion conscious, wearing only the most expensive fashion outfits? Will He have social media accounts where He updates His followers of His latest acquisitions? If people do so on His behalf, what will be His response? Will He employ a security outfit and have multiple bodyguards? Will He upload pictures of expensive vacations on Instagram? If He throws lavish parties, will He invite the crème of the society or the down-trodden? Will He publicise acts of kindness that He has done? If He was to preach for fifty-two Sundays in a year, how many weeks will be devoted to teaching his members how to make wealth? The bible says we are in this world but not of this world. Which means what applies to unbelievers cannot and must not apply to us. So when unbelievers are wealthy and they flaunt it, no big deal. But when Christians are wealthy, we understand that there is a purpose to the wealth and we must use it accordingly. One thing that bothers me greatly is that members of churches whose pastors openly display great wealth vigorously defend their pastor’s wealth. The wealth then becomes a distraction because God has not called us as Christians to justify our wealth to unbelievers. God has called us to make disciples of all nations. In other words, preach the gospel. What gospel does wealth preach? Is it the gospel of salvation or the gospel of prosperity? Jesus told Peter, ‘feed my flock.’ What does a display of wealth by pastors feed the members? When wealth becomes detrimental to the gospel of salvation, then something is definitely wrong somewhere. In fact, we are not supposed to pursue riches because our attention will be divided (Matthew 6:24 – “No one can serve two masters; for either he will hate the one and love the other, or else he will be loyal to the one and despise the other. You cannot serve God and mammon.”). There were extremely wealthy men in the bible (Abraham, Isaac, Jacob, Job and Solomon) but what do we remember them for? These men loved and served God all their days and He no doubt blessed them, but what did Jesus say to the rich young man who came to Him? Jesus said to him, ‘If you want to be perfect, go, sell what you have and give to the poor, and you will have treasure in heaven; and come, follow Me.” (Matthew 19: 21). What that response tells me is that no one can successfully follow God without de-emphasizing worldly possessions to the point where the absence or presence of wealth makes no difference to him or her. Your wealth should mean nothing to you compared to your love for God. If your wealth means nothing to you, will you go to great lengths to flaunt it? Job was tested and God saw that poverty did not make him turn his back on God despite the fact that his fall from grace was absolute. Despite Abraham’s wealth, no reference was made to it in the New Testament, rather, we are reminded that Abraham ‘believed God, and it was accounted to him for righteousness.’ (Galatians 3:6). Despite the fact that Solomon was the richest man ever liveth, we make reference to him more for his wisdom than his riches. His wisdom benefits us as Christians more than his wealth. He himself made the assertion more than once, that ‘…all is vanity and grasping for the wind.’ (Ecclesiastes 2:17). We remember Jacob (Israel) as the father of the twelve tribes that became the great nation of Israel and a symbol of our inheritance through the promise made to Abraham. For those who say that wealth attracts people to Christ, it shows that God is not poor and He has the power to prosper you. I am categorically telling you that you have believed a lie from the pit of hell, copyrighted by Satan and distributed to churches. When God is convincing a man of his sin, that man is not thinking of wealth, but of how unworthy he is of God’s love. Isaiah 53 from verses 2-3 says ‘…And when we see Him, there is no beauty that we should desire Him. He is despised and rejected by men, A man of sorrows and acquainted with grief. And we hid, as it were, our face from Him; He was despised and we did not esteem Him. It is the Holy Spirit alone that can convince a man of his sin. Not even the most anointed man of God can do that on his own. Paul says ‘For since, in the wisdom of God, the world through wisdom did not know God… that no flesh should glory in His presence. …And my speech and my preaching were not with persuasive words of human wisdom, but in demonstration of the Spirit and power, that your faith should not be in the wisdom of men but in the power of God. (I Corinthians 1: 21, 29; 2:4-5). If God had to rely on wealth to attract unbelievers, then every pastor and Christian will be rich, and those who are already rich need not come to Christ. For those who say you need to be rich before you can have access to rich people and so preach the gospel to them, that is another patented lie from Hell Inc. marketed by foolish Christians. Paul stood before Caesar, the most powerful ruler in the world at the time, and declared the gospel fearlessly. Though he did so under circumstances that we pray against in churches today. The truth is that who we are in Christ does not fit into popular culture. The message we carry is not popular either, because it entails self-denial and a disregard to what the world holds dear. But the message we carry is powerful in itself (Hebrews 4:12 – “For the word of God is living and powerful, and sharper than any two-edged sword, piercing even to the division of soul and spirit…”) to do what wealth, oration, packaging and feel-good approaches cannot do. It is the power of Christ and the mercy and grace of God, bringing salvation to those condemned to die. It is the hope of future glory with Christ. Nothing can substitute it. Let us not get carried away, let us not lose focus. Let us continue to disregard the things of this world, and constantly look at Jesus, the author and finisher of our faith. And He will keep us, body, soul and spirit, till the day of His return, Amen. Great writing, flesh n blood did not reveal this. No. Flesh and blood did not reveal this to him at all. As a matter of personal principle, I do not get into debates that start out to tarnish Christ. This one provides clarity on the issue. As such, I have shared it on my Facebook tl and will be a reference document for a long time to come. Thanks for this. Victorious Baba, I love for this I tell you. Though I don't expect less, I still thank God for you on this. God bless you for this delivery. May God save His church from every diluted truth and modified scriptures in order to suit canality! Vic you do well to put this forward! I hope all deceived christians will find this to read and gain wisdom! What I appreciate most in this writeup is the fact that you set out by defining who a Christian is by stating a few assumptions. The definitions get wider and divergent by the day. Certainly a sign of the end time! For me, their stand on wealth is only a reflection of the 'kind' of Christianity they practise. How do you expect someone who believes Christians can never fall from grace think what he does matters? He's told to live anyhow he likes, he's got enough grace that covers them plus an advocate who takes care of them. The today's'gospel' is everything but what we find in the Bible. But he that glorieth, let him glory in the Lord. For not he that commendeth himself is approved, but whom the Lord commendeth. "When storms come, it's what attracted you that will keep you, wealth or the cross." This just hit the nail on the head. May the cross never lose its power in our lives. God bless u… Its an eye opener to me. Flesh and blood hath not revealed this to you but the Sprit of God. God bless you. Sir, I wish i could pour out my heart this same way. this is nothing but absoultely the truth fromthe Book of Life. God Bless your insight and shower you with undiluted Spirit of his Glorious revelations. Interesting write up or I mean WONDERFUL DECLARATION. IT WAS VERY ENCOURAGING READING THIS, THE TRUTH IS STILL WHAT SETS FREE. GRACE TO GROW AND REMAIN IN HIM. The problem is that people are no longrt reading the Bible to be led by God but they rely on whatever their pastors say thus can't differentiate btw lies and truth. They are ready to defend irresponsibly the excesses of their pastors…may God help us all. Good bless you abundantly Sir… This is an undiluted truth. Lets keep praying for body of believers not to loose track of the calling… Galatians 6vs 1. This is just one side of the story of this great journey where some believers are getting it wrong, there are other issues that need to be adequately divided just like you have done. I therefore caution most of us who have been blessed by this piece, not to castigate them, claiming to be better off. Rather we should pray for them for better insight into the gospel… Galatians 6:1, so that we can all come to the unity of faith in Christ Jesus… Ephesians 4:13. God bless you once again sir. Together we can stand. Dr Dummene G. Port Harcourt. Wow, this is the best piece I have ever read in a long while, not only because it is an expository on the current state of what should be The Body Of Christ but also because it is timely; Killing several birds with one shot. I am glad that someone with sound knowledge of scripture would harken the inner voice of truth and boldly speak out because the subject matter is an evil that isn't peculiar to just us here but also to Christians the world over and is quickly sweeping the Church off the path of righteousness. I consider this also a personal wake up call. God bless you sir, thank you very much! Nice write up but to me it's not balanced. You only judged using copious portions of the scriptures . Are we as Christians now to revert to treking, clapping of hands and wearing gowns and keeping beards in order for us not to be tagged worldly? You see, I am never of the opinion that Christians flaunt wealth like the unbelievers but I can never succumb to the lie from he'll that I have to be poor to showcase the splendour of God. What annoyed me was you saying that God is not rich. Have you ever come across the part of the scriptures that said that though Christ is rich but He took the form of poverty that through that we might be rich? My brother, God is not a mystic being as your write-up portends Him to be. I know by this write-up, you may succeeded in impoverishing some minds who the wealth of men of God do not go down well with but you should have channelled this energy towards writing a gospel tract and I would have appreciated it better. Leave these men alone. Do your own thing and serve God not by trying to get cheap popularity through condemning these people. This will only spread hate among Christian. I have so much to say to you but one day I hope to see you or get closer to you to know you personally and may be then, we shall have a deeper understanding. God bless you. I did not see all these from the write up. Sure u read it correctly or with a biased mindest!? Do not be a bigot. Did not see all of this in his with up. Sure you read it correctly or with a biased mind!? Don't be a bigot. Sometimes, communication breakdown is not always due to the inability of the writer to write in the most intelligible form but the capacity of the reader to decipher unaided that which is written in a plain language. Learning to unlearn is critical to acquiring new knowledge. Until that important step is taken, new wine will keep bursting the old bottle whenever an attempt is made to unite the two. Is Christ poor? You see you do not have any business with the men of God being rich. Of course, the write-up has even thrown some light on every one that is born again being at the same level with them. So if you are not comfortable with the rich pastors why not open your own ministry? I used to know a pastor that was so poor that anytime he came to our house then we do make jest of him…does that glorify God instead? As for me, I don't have issues with any born again child of God living rich according to God's word. That is my petsonal take. Mind you am never a bigot. God bless you. In your own words " I used to know a pastor that was so poor that anytime he came to our house then we do make jest of him". I can really see your lack of understanding (I wouldn't call anyone a fool) has been from childhood. I was never brought up to laugh at anyone that was poor, even as a child. Surely one those that can't find their faith then starts believing more in the faith and in the name of their pastors to the extent of almost forgetting the name Jesus Christ. Most of all categorise the spiritual strength of Pastors by their wealth. I pity you. I think it is imperative that I make certain clarifications. I am not against Christians attaining wealth, that was stated categorically in the article. I also gave examples of very wealthy men that we read of in the bible. Christ died, primarily that we might attain salvation. Being rich is only an added advantage. The point I made, which has been misconstrued, is that as Christians, there is something of greater value to us than material riches that we should pursue. In doing that, God himself will bless us. The question then remains, when God blesses us, what do we do with it? Yes, we must not be poor before God's splendour is seen in us, but must we be rich before God's splendour is seen in us? More importantly, what exactly do you understand as the splendour of God? I can understand that our limited understanding as humans makes us explain God with human attributes, but the truth is, the entirety of who God is, is beyond human comprehension. However, in scriptures, He has revealed some aspects of Himself to us and that is how we know that God is spirit. I suggest you read Phillipians 2:1-11 for you to have an understanding of the humility of Jesus Christ and the resultant effect, then weigh the actions of these men of God against the life Jesus lived on earth and see if there is any correlation. As for using copious portions of scripture; is it not better to use copious portions of scripture than basing all my arguments on just one passage of the bible? I cannot change your perception of my motives for writing this piece, but let me state that I only sought to right the wrong that has become prevalent among Christians and to point people in the right direction. If you can show me errors that are a reflection of a personal opinion in this article, using the bible as reference, then I am absolutely willing to make the necessary adjustments. Till then, I stand by every single word written. May your faith not wave. Many will attack this write up with so much apostasy. But the truth remains the truth. The Spirit guide you. Nice piece but God is not neutral. He is rich in all things. No where in scriptures was poverty accrued to Him.that's a point to note.saying God is neutral implies that He is neither righteous nor wicked and so on. That implication is not in line with His word. He is right. Rich is a man made concept.. Attributed to people with things we as humans add value to. Rich puts God on a scale.. A human scale.. God is GOD.he can't be measured, GOD Is GOD. God is "Mystical"-a spiritual mystery and fascination, We try to comprehend just a little of the surface that is revealed to us by His spirit that this human body can handle. God will bless and increase you more in His wisdom. I hope we learn fast that everything will pass away someday, we bring nothing and definitely we are taking nothing when going. Vanity upon vanity… all is vanity. God bless you for this brilliant write up…this is what it means to rightly divide the word of truth. God bless you plenty. This wonderful article is written Mr. olalade Olatunji but one Mr Victor who posted it is taking. Or are Olatunji and Victor one and same person? Ololade Olatunji owns and runs the blog. Mr Victor is a contributing writer. Sir, I want to know first if you are a Born Again. God bless you. For all the questions that was asked "would Jesus do this" made me convinced me Our gospel is so faulty. Thank you so much for reminding us again. The spirit has spoken through you.May we all yeild to His sayings.Amen.God bless you Sir. Anything we can get without Christ (e.g wealth) is NOT the reason Christ died. What then will you use to attract the man/woman who is rich in material things but poor in his Spirit – in need of a regenerated spirit ? The undiluted message of Jesus Christ present in love (persistently) is enough. Trust the Holy Spirit. Well said bro! But I'd rather be a wealthy and influential believer like Cornelius in Acts 10, The Centurion in Luke 7, The Ethiopian in Acts 8:26 and many more. You don't need to be rich to make heaven and neither will poverty make you go to hell. As for me, I choose to live in abundance as a believer, empowering the poor and propagating the gospel. Thanks for the article. It is quite detailed and points well laid out. 1. Poverty is not the absence of money. It is much more than that. It is a lack of ability which results in the lack of required necessity. 5. There is a difference between a show of wealth and a perceived show of wealth. No man can judge another of flaunting his wealth. The issue here is a thing of the heart and only God can see the heart. Note, there are some of us believers that are so blessed that the proceeds of the blessing cannot be hidden. Until you know my heart, you cant truly tell whether or not my display is carnally motivated. 6. If we all focus on the Word, we will realise that these unecessary debates are a ploy of the devil to distract us. I do not believe an unbeliever has a right to dictate how the believer should live. A goat cannot tell a dog how to bark. Let us shine our lights so bright that men will see us and glorify God. Sir, firstly Abraham wasn't promised riches, it was an added advantage of the covenant but as our writer is pointing out it wasn't the convenat itself. The promise to Abraham was A Great Nation /Land/Blessings extended to his seeds. Secondly by our current day standards of riches.. JESUS was poor… He didn't even have a place to lay his head (Matt 8:20).but the TRUTH is that it shouldn't matter whether rich or poor because that's not important in the scheme of the gospel. Well done…..Rich or Poor, I take this, remaining focused on the one thing, eternal life…..it is just spirit sense…not common sense! Wjat is this headache about being rich as a pastor?! A lot of us havung headache about being this definitely have a lot of habits Christ would want us to shed but here criticising wealth of pastors! Salvation is all encompassing! Deliveranve from darkness, sin, sickness, ppverty! Etc if you decide not to activate all areas your headache please stop hating! A piece to be read by all Christians. sometimes, let's try to help other people's heart. but i really enjoyed reading it. God bless you more. Hello, the article was NOT written to deride Pastor Biodun or any other man of God. 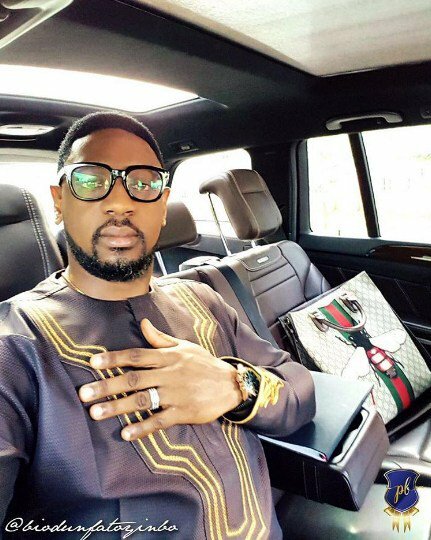 Mr Victor wrote this shortly after a story on Pastor Biodun's alleged "show off" of his Gucci bag gained traction on social media as well as reactions to the post. And he felt the need to add his two cent. Please why did u uploaded Past Biodun's picture since u never revealed the names of the Pastors u are referring to? There's nothing here that'll be of any benefit to a believer if you read it with a defensive ready-to-fight attitude. It's easy to twist these words to make it sound like the writer is anti-prosperity. But if you read it with a mind not to condemn or defend any man of God but rather pick up valuable truths to help you in your own life as a christian; this is a balanced and thought provoking piece. "…As He is, so are we in this world…" We need to reevaluate our focus and what our walk with God is about.